another very good friend of mine died in the most horrific of manners this morning. he had been missing for 2 weeks, and i knew he had gone to play with the girl dog in heat down the street so i didn't worry too much about him despite the fact that there are many dogfights around at these times. he still trudged home at night to get his fish and rice. two days ago he came back for good, with a limp and a general listlessness that wasn't like him. i figured he had just been in a fight, so i pet him a lot and showed him i loved him, gave him a bath for his new fleas. 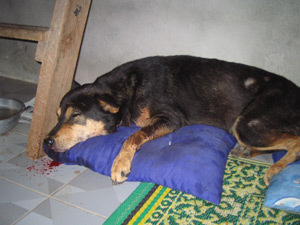 but then yesterday morning he started bleeding from his nose and mouth, nonstop, and had serious problems breathing. puzzled, i threw him in a jeep and drove him through the jungle to town, where luckily there was a vet available. the vet took her time in diagnosing- drew blood and urine, felt around a bit. finally she pulled me over excitedly to the microscope and said "look here!" i peered in to see a mess of squirming worms tainting a drop of scruffy's blood. heartworms are horrible. they take over the heart, of course. i have seen some gruesome pictures of them in the last day. what they did to scruffy was infiltrate themselves into his lungs as well. the bleeding was an embolism, and heartworms produce a chemical which prevent the blood from clotting. i didn't know this until much later on. the vet gave scruffy an injection and me some advice to keep him still and quiet for 2 weeks while he endured some of the harshest treatment available to dogs- heartworm treatment is almost as bad as heartworms alone. scruffy seemed ok and i drove him on the long trip back home while he slept and bled quietly. later on, something clicked in my head, and i suddenly just knew scruffy was dying. it hadn't really occured to me it might be serious. i looked up heartworms on the internet and knew for sure- he had an advanced infestation and couldn't possibly live through treatment (the drug is a form of arsenic that leaves toxic dead worms in the body). i made scruffy a bed of newspapers and pillows, prepared him a bowl of water with electrolyte solution, and began the long night. he must have bled his whole inside out. for hours i just pet him and crooned to him while he stared helplessly at me. it wasn't too long before he vomited black blood like earth. soon after his kidneys started to fail and he peed straight blood with a small scream. still he held on through morning as i paced and tore out my hair. his breathing was horribly labored and he couldn't move on his own. i touched each of his parts so he would have one last snuggle with life. at about 2am a very surreal thing happened. i noticed a fly fluttering on the wall. a small gecko came out and chomped it. slowly i realized the room was filling full of these flies. they were pouring in swarms through the slat on the window. flies hit my eyelashes and buzzed in my ear. puppy started humming curiously upstairs at the flies that had gathered there. scruffy sat up and looked around in a daze. all the lizards flew out of their hidey holes to enjoy a surprise midnight snack. i ran to turn off the lights and flip on the one in the bathroom, prompting the fluttering hoard to change venues. scruffy gave a good natured cough and ended up spluttering and glazed over for 20 minutes. finally at 10am this morning he stood up unsteadily as if to run out the front door and play. he immediately fell over, hitting his head. i picked him up and held him and rocked him as his lungs failed him at last. he had a small seizure and gasped fruitlessly for breath for what seemed like days but was probably only a minute or so, then one violent shudder passed through his body, i told him goodbye, and he was gone with a grimace. i have never seen something so horrible in my life. it just so happens every single one of my friends have left together on a big visa run trip, so i have no one to share this with but you readers. i have cleaned the puddles of blood and various other bodily fluids from my floor, threw out the drenched pillows, and dragged scruffy's shell out to the back step. i am waiting desolately for my neighbors to come around and help me bury my very favorite pal, but i am finding it hard to believe i just watched another dog so happy, full of life, and gorgeous in spirit disappear from my life forever. i feel so bad that i couldn't help... but at least i let him know he was loved before he went. and maybe, as they say, i will see him someday on the other side of the rainbow bridge. goodbye my scruffy dog. you were too good for this world. to j, who left me a comment saying "What utter crap... This is why you can not write...Over the top tripe...I did not feel sorry for you at all because of that puke you dribble out has not a thing in it other that your looking for attention and I did not get any hint that showed any feelings for the dog just artie flowery words of someone trying way to hard and failing. " - wow, what an insensitive person you are. this blog has never been about me trying to be a good writer, it has always been about my trying to put down what i feel honestly, for myself as much as for anyone who might drop in to read. if you don't like my writing, don't read it, but your discounting the feelings i put down on here as tripe is way out of line. you don't have any right to twist my words into something they are not and throw them back at me like they are some kind of truth. if you can't tell that the last 2 days have been some of the worst i can remember then that is your problem, not mine.